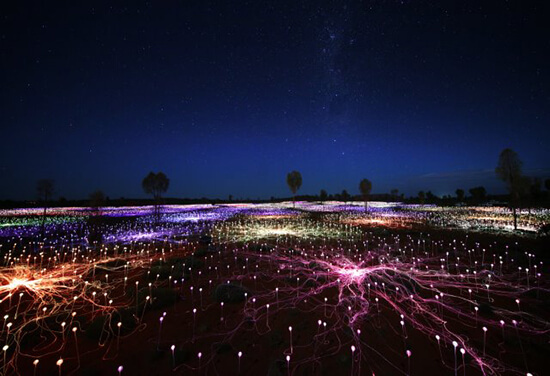 The undisputed heart of Australia, Uluru – sometimes known as Ayers Rock – seems to float on an ocean of coloured lights. It is timeless majesty. Sacred, eternal, unmissable in every sense, Uluru is the 348m rock formation that dominates the landscape of Australia’s Red Centre – geographically and spiritually at the heart of the nation. So how do you complement an international icon? The Field of Light installation, by acclaimed artist Bruce Munro, comprises 50,000 solar-powered lights that offer a unique counterpoint to the star-filled night sky over the monumental rock. Uluru is held sacred by the Aboriginal people of Australia’s Northern Territory, and is a UNESCO World Heritage site. Best viewed at dawn or dusk, when the sandstone glows red, it has long been a key element of any Australian holiday. Now, with Munro’s radiant glass spheres planted as far as the eye can see before its inspiring silhouette, Uluru comes to life each night, embraced by vibrant colour. A trip out to Uluru, or Ayers Rock, is an essential, once-in-a-lifetime experience for any global traveller new to Australia. The Field of Light art installation will be in place until March 2018. Experience Uluru’s majesty for yourself. Our fantastic Australia: Sydney, Rock & Reef Journey includes this monolith alongside other iconic highlights. Book 16 days from £2,599pp when you make an appointment with our Travel Experts.